Was Michael Vick’s MNF Performance The Best Fantasy Football Performance Ever? 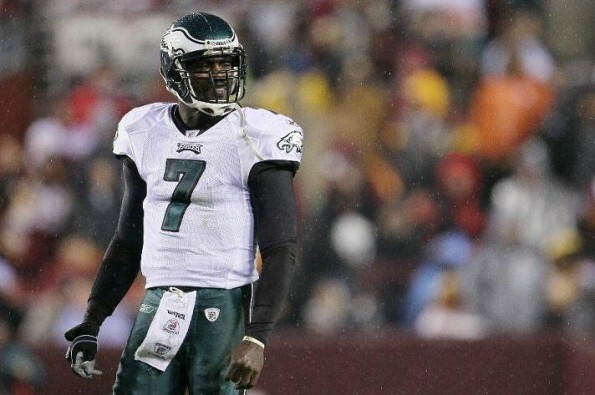 | Total Pro Sports Was Michael Vick’s MNF Performance The Best Fantasy Football Performance Ever? Was Michael Vick’s MNF Performance The Best Fantasy Football Performance Ever? Fantasy owners who entered Monday night’s game between the Eagles and the Redskins with a 50 point lead and only Michael Vick remaining on their opponent’s roster likely thought it was Game Over…Think again! Vick’s improbable 333-yards passing, 80-yards rushing and six total touchdowns (4 passing, 2 rushing) likely had several fantasy owners jumping for joy, and several others drowning in their own tears. But where exactly does Michael Vick’s performance rank among the all-time best fantasy football single-game performances? In standard leagues with a point system of 1 point for every 25 yards passing, 10 yards receiving and/or 10 yards rushing, 6 points for every touchdown, and -2 points for every lost fumble or interception, Michael Vick was able to accumulate an astounding 57 fantasy points (333 passing yards = 13 points, 80 rush yards = 8 points, 6 touchdowns = 36 points…13+8+36=57 points). The highest statistical fantasy football output in an NFL game (that we have record of) came back in 1961, courtesy of Billy Cannon. During a game against the New York Titans, Cannon recorded an amazing 216 rushing yards, 114 receiving yards, and five total touchdowns, for a total of 62 fantasy points. So does this make Cannon’s performance the greatest in fantasy football history? Well, not exactly. You see, according to Wikipedia, the rules for fantasy football were first created in 1962 by a former Oakland area business man and limited partner in the Oakland Raiders. The next three greatest fantasy football single-game performances came from Gale Sayers in 1965 (113 rushing yards, 89 receiving yards, 6 total touchdowns, 55 points), Cookie Gilchrist in 1963 (243 rushing yards, 5 total touchdowns, 54 points), and Clinton Portis in 2003 (218 rushing yards, 35 receiving yards, 5 total touchdowns). However, none of these were greater than Vick’s 57-point output from last night. Watching your favorite NFL team win a big game is great, but it is tough to beat the feeling of watching your fantasy team’s stud quarterback put up the highest fantasy football total ever. Some teams don’t even put up 57 points between their quarterback, two running backs, two wide receivers, tight end, kicker and defense. Vick did it all by himself, and just think of how much more he could have done had this game been closer. After all, most of his production came in the first half (five of his six touchdowns). 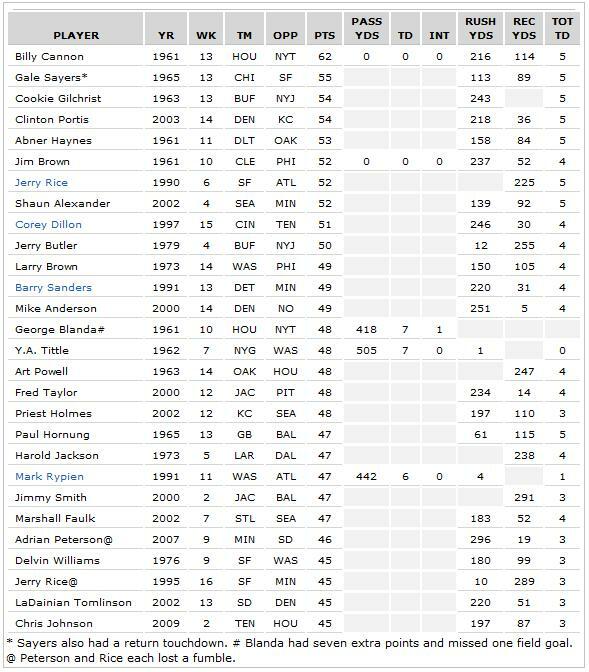 As for some of the other great fantasy football performances over the course of the past half century that fall just shy of Vick’s Monday night massacre, here they are for your viewing pleasure.